When I was at Full Sail University, among the most frequent forewarnings given by the game dev faculty pertained specifically to Final Project. This capstone assignment—and critical differentiator to other game development schools—puts one or more graduate students in charge of a group of undergraduate art and development students to produce a full game in five months. Now, Final Project is far from a well-oiled machine, but the school does crank out a couple or three decent student works every month, of which mine was one in November of 2010. I cannot speak to the Game Art or Game Development programs, but the first seven months of the master’s in Game Design is almost entirely in preparation for Final Project. Leadership courses, production courses, project management courses—though the degree is labeled Game Design it is more accurately a production degree, tailoring students to fulfill the role of associate producer upon graduation. It was my Project Management Principles professor who told me the greatest risk a project manager will face is people. Post-Final Project, I can agree with him whole-heartedly. From pain-in-the-asses to slackers and Negative Nancy’s, inevitably a couple bad eggs will negatively affect—if not poison—a collaborative project. And it is never any fun dealing with these kinds of people as a manager. But among the most common nuggets of advice from students ahead of me as well as the faculty themselves—and that which I contend to be the second most significant risk in game development—is scope. 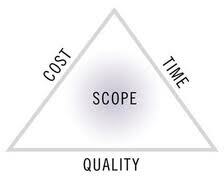 Identifying the scope of the project—in reference to the three key factors of quality, time, and cost—and building a concept comfortably around the contours of these limitations, is not easy. It’s not easy for guys more experienced than me, but in Final Project, it’s damn near impossible. To avoid crunch and ensure a painless process, the immediate inclination is to build a simplified yet polished game; say, aim for a one that can be completed in a month and spend the rest of the time liberally applying polish while squashing bugs. But the school is there – as is my guess the publisher is too in the real world – to push you to do more with less. This is what separates the boys from the men, and the folks in the industry and those without jobs. In retrospect to Final Project, I can comfortably say I battled with scope about as much as I did with people, but even in the real world with real AAA games, I repeatedly see scope as an issue. It could be a publisher pushing too hard, it could be poor developer estimates, and it could be that definitive games industry over-zealousness to do more better that ultimately detracts from the first title of a new franchise. But you see it in many new AAA franchises, especially when a popular new one launches a sequel. Case in point: Assassin’s Creed. A franchise sitting on the backlog until a couple months ago, I played through the first game immediately followed by the second; will be starting Brotherhood shortly. 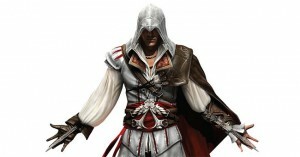 Now, without launching into a full-fledged review of either game, I’ll say this: Assassin’s Creed was a good game. It was held back from greatness due to problems regarding scope. Anyone and everyone agrees that the first entry in this series was repetitive. Three sprawling cities, each divided into three unlockable districts with—literally—the exact same tasks repeated without deviation. Outside of the repetitiveness, it’s not as easy to point out the multitude of shortcomings in Assassin’s Creed until you sit it next to its sequel. Assassin’s Creed 2 improves over the first game in this franchise in virtually every way imaginable. The core mechanics of climbing, running, and fighting are comparatively silky-smooth, the graphical difference is striking at worst, animations are fluid, the structure and presentation is more appreciable, and even the character development and story is improved. If any of this seems questionable I urge you to try playing the first game again; after the second (and I’m guessing it’s safe to say after Brotherhood as well), it is rendered nigh unplayable. Where the first game in a new franchise like this is burdened with building the game from the ground up, whether it’s a borrowed engine or a developer’s own, the sequel gives the developer the opportunity to build upon the existing framework, reducing the upfront technical and creative workload. The tech is there, though it may not be optimized, and the concept is there, though it may not be polished. A sequel in this case represents the opportunity to bring the predecessor’s quality up to where it should be while adding a handful of innovations to not only create a polished experience, but a new one as well. This being the case, why can’t the first game in a franchise scale back a bit in scope such that the level of polish may be increased, producing a better product? 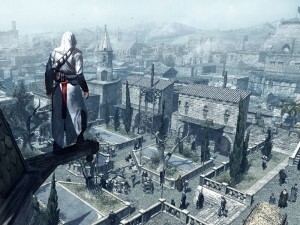 The core, unskippable gameplay in Assassin’s Creed is as follows: the player must assassinate an important person, but first they must enter the district of the city in which the person lives. Next, the player travels to the city contact for forgettable backstory. Then the player must find and enter a minimum of two to three subquests which are an amalgam of the following: pickpocket an NPC with a bit of stealth, interrogate an NPC through fisticuffs, eavesdrop on a scripted NPC conversation by sitting on a bench near them, or subtly killing a few targets under a time limit so an informant NPC can feel comfortable giving you information. The player can then activate the district’s assassination quest by returning to the city contact, then travel to the assassination target, watch a scripted event, kill the target, and escape back to the contact. It seems to me at some point during production of Assassin’s Creed—when the core gameplay formula was revealed and about to be duplicated no less than eight times without variation, that somebody should have scratched their head. Should the developer take the experience in one district of one city and duplicate it repeatedly without variation, linked loosely by a story nobody cares about and… 420 collectibles?! This is in addition to finding and killing 60 Templar, finding and scaling 91 High Points, and finding and killing a throng of guards harassing a civilian 108 times in addition to all those collectibles. Yikes. The scope of Assassin’s Creed should have been slashed, distilling the entirety of the game to one sprawling city and polishing it to the extent of Assassin’s Creed 2. The game should have been released at a lesser price, with less associated development time and less cost, all to the benefit of the game and the people who made and funded the project. It is a tough decision, and it is a drastic decision, but it is also the right decision for all parties—including the publisher. This is a decision a producer needs to make; it is a decision I had to make when I dutifully monitored the second biggest risk in the development of my team’s game in Final Project. 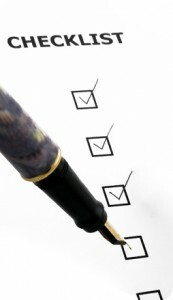 When a decision is made in respect to quality, time, cost or scope, the other factors are affected. Does a studio and publisher want to be remembered as those responsible for making the product the best it can be (Blizzard, Nintendo), or does one want to let quality suffer so scope can remain at a twenty-hour, sixty dollar adventure (everybody else)? This industry, including its publishers, needs to break out of the tired stereotype that the biggest commercial games must weigh in at a certain length and come with a certain pricetag. We need not be afraid of tighter, compelling gameplay experiences; Hell, if Assassin’s Creed was slashed in scope, polished, and released digitally, it could have made a run for downloadable of the year! Releasing a game too soon is no good for all parties involved, both immediately and long-term. Though delays can be a pain, there is no lack of content out there to keep players satisfied, and although frustrated, players will in the long run appreciate the initiative for quality. There is always a sequel and always more money to be made, but only if quality is high enough; when a game comes out of the cooker too soon, a potentially lucrative franchise can be cut down before it even has a chance. Joshua is a graduate of Full Sail University’s Masters Program in Game Design.